The Ludwig Institute for Cancer Research Ltd is an international not-for-profit organization with a 40-year legacy of pioneering cancer discoveries. The Institute provides its scientists from around the world with the resources and the flexibility to realize the life-changing potential of their work and see their discoveries advance human health. This philosophy, combined with robust translational programs, maximizes the potential of breakthrough discoveries to be more attractive for commercial development. The Ludwig Institute conducts its own research and clinical trials, making it a bridge from the most basic questions of life to the most pressing needs of cancer care. Since its inception, the Institute has invested more than $1.7 billion of its own resources in cancer research, and has an endowment valued at $1.2 billion. The Institute’s assets are managed by the LICR Fund. Dr. Lucy Shapiro, DF, Ph.D serves as Virginia and D.K. Ludwig Professor of Cancer Research in the Department of Developmental Biology and Director of the Beckman Center for Molecular and Genetic Medicine at the Stanford University School of Medicine where she has been a faculty member since 1989. Dr. Shapiro founded Stanford University’s Department of Developmental Biology in 1989 and served as its Chairperson from 1989 to 1997. Co-Founder, Co-Chair of Scientific Advisory Board, Director and Member of Nominating & Corporate Governance Committee,Anacor Pharmaceuticals, Inc.
Age Total Calculated Compensation This person is connected to 46 board members in 3 different organizations across 6 different industries. Using her unique worldview as both artist and scientist, Shapiro revolutionized the field of developmental biology and set the stage for the new field of systems biology. Stanford developmental biologist Lucy Shapiro, PhD, whose unique worldview has revolutionized the understanding of the bacterial cell as an engineering paradigm, will be the commencement speaker for the School of Medicine Class of 2015. The diploma ceremony will be held June 13 from 11 a.m. to 1 p.m. on Alumni Green, followed by a luncheon at 1 p.m. on the Dean’s Lawn. Shapiro, the Virginia and D. K. Ludwig Professor, has spent her career on the leading edge of developmental biology. She is the recipient of numerous awards, including the National Medal of Science in 2012 and the 2014 Pearl Meister Greengard Prize, which celebrates the achievements of outstanding women in science. Shapiro, director of the Beckman Center for Molecular and Genetic Medicine, has been a faculty member since 1989, when she founded the medical school’s Department of Developmental Biology. A painter who studied both biology and the fine arts as an undergraduate, Shapiro said that she sees science as part of the world of art. She began her career as a scientist focused on finding new ways of looking at and understanding living things, much as an artist does. She started by hunting for the simplest organism she could find — a bacterial cell — and then studying its molecular mechanisms. Her research into the genetic circuitry of these cells paved the way for new antibiotics. Her use of the microorganism as a model also set the stage for the emerging field of systems biology. She has served in advisory roles in both the Clinton and George W. Bush administrations on the threat of infectious disease in developing countries. She has said that increasing levels of both antibiotic resistance and novel infectious agents are likely to be a larger threat to the world than bioterrorism. Shapiro also started a biotech company to test and develop antibiotic and antifungal medications. At the medical school’s commencement, Lucy Shapiro described how years of solitary work in the laboratory led her to influence public policy and battle the growing threat of infectious disease on the global stage. Developmental biologist Lucy Shapiro, PhD, told the 2015 School of Medicine graduates how, as a basic scientist who spent most of her life studying single-celled bacteria, she stepped out of her laboratory and onto the global stage to try to help the world avert a potential disaster. “About 15 years ago, I sat up and looked around me and found that we were in the midst of a perfect storm,” said Shapiro, the Virginia and D. K. Ludwig Professor, speaking at the school’s commencement June 13 on Alumni Green. “There was a global tide of emerging infectious diseases, rampant antibiotic and antiviral resistance amongst all pathogens and a poor to nonexistent drug pipeline. She took any speaking engagement she could get to educate the public about antibiotic resistance; walked the corridors of power in Washington, D.C., lobbying politicians about the dangers of emerging infectious diseases; and used discoveries from her lab on the single-celled Caulobacter bacterium to develop new, effective disease-fighting drugs. A recipient of the National Medal of Science, Shapiro exhorted the graduates to be unafraid of breaking out of their comfort zones and to use science to improve the human condition. Bridging the gap between the lab and the clinic can make the world a better place, she said. Lloyd Minor, MD, dean of the School of Medicine, also emphasized the importance of bench-to-bedside work in his remarks to the graduates. There has never been a better time for shepherding advances in basic research into the clinic, he said. 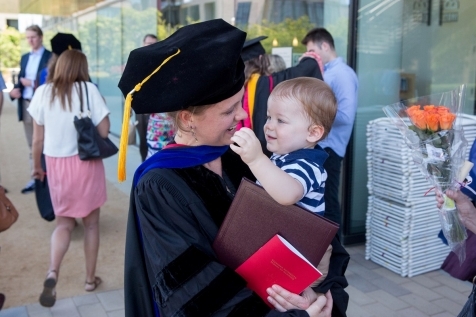 Kristy Red-Horse, assistant professor of biology, hoods Katharina Sophia Volz, the first-ever graduate of the Interdepartmental Program in Stem Cell Biology and Regenerative Medicine. “You are beginning your careers at an unprecedented time of opportunities for biomedical science and for human health,” he said. This year’s class of 195 graduates comprised 78 students who earned PhDs, 78 who earned medical degrees and 39 who earned master’s degrees. It included Katharina Sophia Volz, the first-ever graduate of the Interdepartmental Program in Stem Cell Biology and Regenerative Medicine — the first doctoral program in the nation focusing on stem cell science and translating it to patient care. Volz, whose work in the lab has opened the doors to improvements in clinical care for heart patients, said Stanford Medicine is the place to be for scientists who want to make a difference in the world. “Everybody here is reaching for the stars. We can do the best work here of anywhere,” said Volz, 28, a native of Ulm, Germany, the birthplace of Albert Einstein. She has worked in 10 different labs across the globe. Her father and mother, Johannes and Luise Volz, traveled from Germany to celebrate with her. “I’ve never been in a more supportive environment,” said Volz, who discovered the progenitors to the muscle layer around the coronary arteries, a finding with implications for regenerative medicine and finding treatments for coronary artery disease. Some in the crowd of well-wishers, seated under a giant white tent, held garlands of flowers for the graduates, while toddlers ran around the lawn and babies fussed and cried. The two student speakers added humor and pathos to the occasion, with memories of their years of hard work and discovery. Brook Barajas, who earned a PhD in cancer biology, holds her 15-month-old son Sebastian. The dozens of hands shooting up from the stage were followed by laughter from the crowd. Meghan Galligan, a medical degree graduate, said she was both nervous to be in front of the crowd and concerned about whether her puffy black graduation cap would stay put. “I’m wearing a French pastry hat and worried it’s going to fall off,” she said. Shapiro’s desire to improve the human condition led her out of the lab to the nation’s capital. She has since served in advisory roles in the administrations of Bill Clinton and George W. Bush on the threat of infectious disease in developing countries. Now director of the Beckman Center for Molecular and Genetic Medicine at Stanford, Shapiro has been a faculty member since 1989. She was founding chair of the Department of Developmental Biology and also started a biotech company in Palo Alto to test and develop antibiotics and antifungals. Her lab at Stanford made breakthroughs in understanding the genetic circuitry of simple cells, setting the stage for the development of new antibiotics. Shapiro told the audience that over the 25 years that she has worked at the School of Medicine, she has seen a major shift in the connection between those who conduct research in labs and those who care for patients in clinics. Monica Eneriz-Wiemer, who earned a medical degree, hugs her mother Gloria Eneriz on June 13 before the School of Medicine’s diploma ceremony. This new connection, she said, is key to the future of global health. “This is no ordinary time, from shattering political unrest in the Middle East and North Africa and the consequent flood of immigrant populations that serves as a petri dish for infectious pathogens, to global shifts in urban environments, to climate change, which is having substantial impact on health … all contributing to the appearance of old pathogens in new places and new pathogens for which we have no immunity. This is your time to shape the future, Shapiro told the graduates. In closing remarks, Laurie Weisberg, MD, president of the Stanford Medicine Alumni Association and clinical professor of medicine at UC San Francisco, also encouraged students to step outside of their comfort zone. “You may be the most brilliant, creative and productive scientist, clinician, writer or entrepreneur, but you’ll never know if you don’t embrace uncertainty, take on a new challenge, and give it a try,” she said. “To do what you love, and do it well, with all your heart — that’s what most important. Tracie White is a science writer for the medical school’s Office of Communication & Public Affairs. Email her attracie.white@stanford.edu. Stanford Medicine integrates research, medical education and health care at its three institutions – Stanford University School of Medicine, Stanford Health Care (formerly Stanford Hospital & Clinics), and Lucile Packard Children’s Hospital Stanford. Skin harbors our largest reservoirs of stem cells. To maintain the body barrier, epidermis constantly self-renews and hair follicles undergo cyclical bouts of activity. Both stem cell compartments participate in repairing tissue damage after injury. Dr. Fuchs studies where adult stem cells come from, how they make tissues, how they repair wounds and how stem cells malfunction in cancers. Her group focuses on the mechanisms that impart skin stem cells with the ability to self-renew, develop and maintain tissues, and how these cells respond to external cues, and depart from their niche to accomplish these tasks. 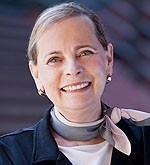 The 2012 March of Dimes Prize in Developmental Biology has been jointly awarded to Elaine Fuchs, of the Rockefeller University and Howard Hughes Medical Institute, and to Howard Green, of Harvard Medical School, for their pioneering research on the molecular workings of skin stem cells and inherited skin disorders. The prize recognizes researchers whose work has contributed to our understanding of the science that underlies birth defects. http://dx.doi.org:/10.1242/​jcs.01408 Oct 1, 2004 J Cell Sci 117, 4877-4879. Elaine Fuchs was born in the United States and raised just outside Chicago. In 1972 she graduated with a B.S. and highest distinction in the Chemical Sciences from the University of Illinois. Her undergraduate thesis research in physical chemistry focused on the electrodiffusion of nickel through quartz. She moved from Illinois to Princeton University to study for her PhD in Biochemistry, investigating changes in bacterial cell walls during sporulation in Bacillus megaterium. In 1977, she joined Howard Green, then at Massachusetts Institute of Technology (MIT), for her postdoctoral studies. There, she focused on elucidating the mechanisms underlying the balance between growth and differentiation in epidermal keratinocytes, a system and research area that continues to fascinate her today. In 1980, she was recruited to the University of Chicago, where she moved up through the ranks to the position of Amgen Professor of Molecular Genetics and Cell Biology and Investigator of the Howard Hughes Medical Institute. She moved to The Rockefeller University in 2002, where she is now the Rebecca C. Lancefield Professor of Mammalian Cell Biology and Development. Elaine’s research has encompassed identifying and characterizing the keratin genes expressed in human skin, understanding the transcriptional mechanisms underlying gene expression and differentiation in the epidermis and hair follicles, and revealing roles for Wnt and BMP signaling in skin. Currently, her lab’s focus is on understanding the niche for multipotent stem cells in skin. The thread that ties her research areas together is epithelial morphogenesis, understanding how external cues transmit their signals to elicit changes in transcription, cytoskeletal architecture and adhesion to establish the epidermis and hair follicles. In the interview that follows, Fiona Watt, Editor-in-Chief of JCS, asks Elaine about her experiences as a woman in science. FMW:How has your research career impacted on your personal life and vice versa? EF: My father was a geochemist who specialized in meteorites at Argonne National Laboratories. My aunt, who lived in the house next door, was a biologist at Argonne, and an ardent feminist. My sister, four years my senior, is now a neuroscientist. My mother is a housewife, who loves gardening and cooking and used to play piano and paint in oils. Growing up in such a family, and with farm fields, creeks and ponds in the near vicinity, I developed a deep interest in science that has carried me through my professional life. If I think back to the family influences that shaped my choice of career, I remember that my Dad strongly advocated my being an elementary school teacher. My aunt, his sister, was denied admission to medical school and she encouraged me to go into medicine. My mom told me that she thought I was a good cook and therefore I should become a chemist. My older sis was my idol, although I found her intelligence intimidating. She thought I should become an anthropologist. So, in contrast to my close friend and former colleague Susan Lindquist (now director of the Whitehead Institute at MIT), I was strongly encouraged by my family to go to college and do something with my life. I chose the University of Illinois at Urbana (my Dad told me that if there was a good reason why he should spend more than $2000 a year on my education, we should sit down and discuss the matter – otherwise, I should select either University of Illinois, our State school, or University of Chicago, where he got a tuition break. I vowed NOT to go to University of Chicago, because my sis, Dad and aunt went there, and I wanted to be different). Elaine Fuchs in her lab in 1980. By contrast, my participation in Vietnam War protests had a deeper impact on me, and I decided to apply to the Peace Corps. Having spent my electives taking Spanish and Latin American history, I was hoping to get accepted to go to Chile, which was headed by Allende, a liberal democratic Marxist. I was instead accepted to Uganda, which was headed by Idi Amin, a ruthless tyrant. It was then that I began in earnest contemplating graduate school, choosing Princeton’s Biochemistry Department, to move from physical sciences into the realm of more medically oriented science. I always suspected that my father was somehow behind the decision by the Peace Corps to send me to Uganda, but in the end going to graduate school was probably the right choice for me. Not having taken biology since high school, I gravitated towards the most chemically oriented labs at Princeton. When I went to visit Bruce Alberts, he informed me that he only took the best students, which I was certain did not mean me. Marc Kirschner was no longer focused on physical biochemistry, but instead had begun working with disgusting-looking frogs. I settled on a Professor who had been quite open about his views that women should not be in science. Despite the fact that I was viewed by my mentor as a major disappointment relative to a fellow male graduate student who joined the same lab, I did learn from my mentor how to do well-controlled experiments, for which I’ve been forever grateful. Twenty years later, my mentor’s views regarding my relative lack of scientific skills even seemed to soften a bit. Although I received my PhD in biochemistry, my education had not been very typical. I graduated without yet isolating protein, RNA or DNA. However, I had been frugal with my $3000/year graduate stipend, and had managed to travel (3rd class) through India, Nepal, Guatemala, Mexico, Peru, Bolivia, Ecuador, Turkey, Greece and Egypt (I’ve still never gotten to Chile or Uganda). In retrospect, I understand why my advisor had not taken me seriously! Somehow, I managed to be accepted into the lab of Howard Green at MIT, and during my postdoctoral years, I limited my travel to Morocco, and began in earnest doing experiments. I chose Howard’s lab, because he was one of the pioneers in mammalian stem cell biology. He had developed methods to culture human epidermal stem cells under conditions where they could be maintained and propagated. I was yearning to switch model systems from bacteria to humans, hoping that my research might be more medically applicable, and I wanted to study the biochemical mechanisms underlying the balance between growth and differentiation in normal human cells. The system seemed ideal, and led me to become a skin biologist. Mouse genetics came later in my career after I was appointed to the HHMI at the University of Chicago, and had the resources to complement the culture system. My experience at MIT had a powerful impact on my career. Howard Green was a quintessential cell biologist, which was something completely new to me. Nearly every lab at MIT was humming with brilliant postdocs, and I rapidly got hooked on the excitement of the science around me. I began to think that perhaps a scientific career might even be a possible goal for me – at least at some small teaching college or state university. After my first year at MIT, my advisor from Princeton nominated me for an Assistant Professorship at the University of Chicago, something that I assumed was to be a trial run for an academic job later down the road. I viewed the invitation to speak as a free trip home to visit my family, and was quite amazed when I subsequently received a job offer. It was only then when I began to realize that somebody must think more highly of my accomplishments than I did. My family’s pressure to accept the position was relentless and so I began an academic career as an independent scientist, feeling at the base of a totem pole of fantastic colleagues. FMW:What changes for women in science have you observed during the course of your career? EF: At Chicago, I was the first woman in a department of 15 biochemistry faculty members. But Janet Rowley, who already was a member of the National Academy of Sciences and a famous cytogeneticist, was in the Department of Medicine, and she sent hand-written notes congratulating me on every small success that would come my way. This inspired me, as did meeting Susan Lindquist in the Department of Biology, who became my long-standing close friend and colleague. In 1982, Sue also introduced me to David Hansen, to whom I have been happily married for 16 years! Chicago reorganized their biological sciences departments in 1985, and Sue, Janet, several other women and I all chose to join the same Department, Molecular Genetics and Cell Biology. All of a sudden, women faculty members were in abundance and a force to be reckoned with. This and fantastic students became an endless source of enjoyment for me, and I remained at Chicago for over 20 years. I feel that although there is still considerable work to be done to pave the way for women in science, the situation has improved considerably during the course of my career. Women are now routinely asked and elected to serve the scientific community in important ways. In this regard, I have served on the Advisory Council for the Director of the NIH, the Council of the National Academy of Sciences (NAS) and was President of the American Society of Cell Biology. In addition, major scientific organizations have cracked the door open wider for women, and I certainly feel fortunate to have been elected by my colleagues to the NAS, the Institute of Medicine and the American Academy of Arts and Sciences. I also feel honored to have received recognition from my colleagues through a number of scientific achievement awards, including the Richard Lounsbery Award from the NAS and an honorary doctorate degree from Mt Sinai and New York University Medical School. As women continue to make their way in the scientific community at all levels and in greater numbers, we will continue to see a rise in the creativity, reflection and breadth of thinking that is so necessary to move science forward. FMW:Do you feel that being a woman is an inherent advantage/disadvantage for a career in science? Why? EF: I can’t say that it is or isn’t, but for me the discrimination I have faced personally has served as an inspiration and a challenge to do better, not as an impediment to my career. The one thing I do feel now is that it is important for senior women to remember that the road for women scientists is not always an easy one. There is still substantial room for the scientific community to grow in the realization that, by opening the door to women, it is going to raise the level of scientific excellence. Senior women who are recognized by their peers as being successful have a responsibility to help educate those scientists who haven’t quite accepted this important message. And we have a responsibility to maintain the highest scientific and ethical standards and to serve as the best role models we can for the younger generation of outstanding scientists – both men and women – who are rising through the ranks. Leading by good example is still the best way to diffuse the now more subtle and less vocal, but nevertheless lingering, discrimination and dogmatism against women scientists within our scientific community. No discussion of women and careers is complete without addressing the issue of children and motherhood. In my case, I’m afraid I don’t serve as a good role model because I don’t have children. However, I’d like to emphasize that this was a decision that my husband and I consciously made together. I’m married to the Director of Philosophy and Education at Teachers’ College, Columbia University, and for the past 20 years that we’ve known one another, we’ve enjoyed traveling the world, going to operas, symphony and chamber music concerts, eating leisurely dinners, dancing, swimming, quiet reflection, education and service to the broader community. We love our nieces and nephews, but children were not a high priority for our lives together. In another world, things might be different. However, I certainly don’t view this decision as a sacrifice that I had to make for my science. FMW:What are your remaining career ambitions? EF: I made the decision to move to Rockefeller in 2002 because it provided an exceptional constellation of world-renowned colleagues, generating a rich and stimulating new environment for the 17 postdocs and technicians who moved with me. Our research has progressively moved to the field of morphogenesis – understanding the molecular process that begins with a single stem cell and ends with a functional tissue, either epidermis or hair follicles. Characteristic of my checkered past, the research is a blend of biochemistry, molecular biology, cell and developmental biology, and the area enables us to combine our interests in signal transduction, transcriptional regulation, cytoskeletal dynamics and cell adhesion. The caliber of my students and postdocs keeps escalating, and the science continues to keep me in the lab nights and weekends, as it did when I was a postdoctoral fellow. Each day brings new challenges, and there is certainly no doubt now that the flame of excitement and interest in scientific discovery and education burns eternally within me. There is no `last’ objective – only new horizons and challenges. The revolution in biology that I have experienced in my own career tells me not to predict what my next objective will be. I feel strongly that we make of our lives what we put into them. To succeed in a scientific career in academia takes motivation, commitment, effort, thought, creativity, intelligence, teaching skills, technical talent, organization, leadership, oral and writing skills, compassion and a strong sense of ethics. I know I’ve left out many other essential traits. Very few scientists have all these attributes, but we can each achieve a high degree of satisfaction if not success through honing the subset of attributes that we do have. I know that for me, the more I work on becoming a better scientist, mentor and participator in our scientific community, the richer all aspects of my life become. Elaine Fuchs has collected many awards in her 30 years researching mammalian skin development, but it’s hard to beat the two prizes she received in late 2009. Shortly before winning the prestigious L’Oreál-UNESCO award for women in science, Fuchs was awarded the National Medal of Science—the US’s highest honor for outstanding scientific contributions. After studying bacterial sporulation as a PhD student with Charles Gilvarg at Princeton, Fuchs joined Howard Green’s laboratory at MIT, where she investigated the expression of keratins in differentiating skin cells (1, 2). Fuchs then returned to her native Illinois to begin her own laboratory at the University of Chicago, and stayed for more than 20 years before moving to The Rockefeller University in New York in 2002. Fuchs’ research has touched on many aspects of skin differentiation and function. Asked to pick her favorite work, she chooses her pioneering use of mouse genetics to identify mutant keratins as the cause of several human skin diseases (3, 4). She also mentions the generation of super furry mice by expressing a stabilized version of the transcription factor β-catenin (5) as well as the identification and characterization of a multipotent stem cell population in the hair follicle (6, 7). In a recent interview, Fuchs discussed her latest awards, and explained why the skin continues to hold her interest. Is it true that you refused to take the exam for graduate school entry? Yes! [laughs] I was graduating near the top of my class from a very good university and I felt that the Graduate Record Examination wasn’t testing my real knowledge, but rather how I could perform in a written exam. So I decided that perhaps they’d appreciate some creative writing instead. I wrote three pages explaining the reasons why I was not going to be taking my GRE, and I sent it along with my applications. I got accepted everywhere, but it’s quite unlikely that I would be admitted to any graduate program in the US today. I don’t think professors are as open-minded toward rebellious students as they were during the Vietnam War era. How did you decide to go to Howard Green’s laboratory for your postdoc? I had been working on bacterial sporulation and, in the course of that, I studied bacterial cell walls. Many antibiotics target the enzymes that synthesize cell walls, and that medical aspect was what I really liked about my science. To maintain my interest in biomedical research, I decided to switch to the growth and differentiation of human cells, but I knew I was going to need a good culture system. Howard was a cell culture guru—he developed the use of human epidermal cells as well as the 3T3L1 line for adipocyte differentiation. Almost everyone else was using transformed mammalian cells at the time and I thought these were great systems to study—I still do. And you’ve worked on skin ever since—what has captivated you for so long? Skin is such a complex organ. We focus on the epithelium, but epithelial–mesenchymal interactions are very important in dictating whether keratinocyte stem cells will stratify to make an epidermis or differentiate into a sebaceous gland or hair follicle. How does that happen? How do you start with a stem cell and build a tissue? There are lots of facets to the problem, ranging from transcription to cell–cell and cell–substratum interactions. There’s this endless array of signals from the environment that, in a sense, encompasses almost every aspect of biology. So even though we still work on skin as a model system, we continue to ask different questions. We spent 10 years working on keratins, but if I’d stuck with that, I might have burned myself out. I learned early on in my career that it’s important to choose a problem you’re interested in, even if you don’t yet know the technology you need to address it. I think people get into ruts when they become very good at something and do it over and over again. What we’re doing now is very different to what we were doing several years ago, and we continue to try novel and original approaches. Then one day a technician said, “There’s this dead mouse that’s half eaten, and it looks like it’s got a severe problem with its skin.” We took a look and it was expressing whopping amounts of our transgene. We realized that the mom was eating every single phenotypic mutant while leaving behind all the nonphenotypic ones. I gave [laboratory members] Bob Vassar and Pierre Coulombe my office for the night, and they babysat until the moms delivered. After their preliminary analysis, we sat down with a dermatology textbook and it was pretty clear: the pathology matched perfectly with epidermolysis bullosa simplex, a blistering skin disorder in humans. But not everyone believed you at first? But at that point Mina Bissell stood up and said, “I don’t know whether she’s going to be right or wrong, but I just heard an interesting story, and I think we should give her the chance to find out.” This broke the ice for UPenn’s chair of dermatology, John Stanley, to stand up and say, “Actually, I would also diagnose the pathology as EBS.” Eight months later, we published a paper documenting the human genetic basis of EBS, so it didn’t take long to prove our hypothesis. You were one of very few female group leaders when you began in Chicago. How was that? A technician from another laboratory came down as I was setting up my laboratory, and said, “Are you Dr. Fuchs’ new technician?” and I had to say, “I am Dr. Fuchs!” There were cases where I’d be introduced to the seminar speaker as the prettiest member of the department—things that would make me cringe. I didn’t know what to make of these comments, and I’m not sure the men knew what to make of having me there. I didn’t care what my salary was—it was more than I’d got as a postdoc— until after I was a tenured faculty member, when I discovered that my salary was actually lower than what they were offering to starting assistant professors. It was only after I realized I’d been underpaid all those years that I got angry. So there were definitely gender issues that could’ve distracted me, but I was so thrilled to be able to do my science that nothing else seemed to matter so much. You’ve been a strong advocate for women in science, which was recognized by your L’Oreál-UNESCO award. Do any significant challenges remain? Things are enormously better, particularly in the US. In general, the door is open for women all the way up to being an associate professor but it’s still difficult at the upper end of the scale—there are very few women in leadership positions. And there are still women at some universities who feel they are underpaid, have less space, and receive fewer privileges than their male colleagues. Most major universities have gotten the message, but I’m not sure all the smaller universities have followed suit. The other prize you won recently was the National Medal of Science. How was your trip to the White House? Fuchs receives the National Medal of Science from President Obama. Having the President of the United States shake my hand and place a medal around my neck was a moving experience. It was also nice to have not only my husband, but also my mother (who’s close to 88 years old now), my sister, and eldest nephew present. It was particularly thrilling for me because President Obama recognizes the importance of basic research and science education to the future of our country. Could scientists do a better job of communicating the importance of their work? Yes—we need to educate politicians about the importance of basic research and increasing the budget for it. [Former congressman] John Porter, at a recent Howard Hughes meeting, asked us all, “When was the last time you contacted a politician and invited them to your laboratory? They need to see what scientists are doing.” If politicians don’t understand what we can learn from basic research and appreciate its importance, why should they support it? A professor’s role is a combination of research and education. I empathize with the pain students feel as they initially struggle with scientific research, yet there’s nothing more gratifying than watching a student’s first experiment work. You see them think, “Well, it’s really worth it after all. I can do it.” As long as I’m passionate about the scientific questions we tackle, I don’t think I’ll ever get tired of being a professor. It’s the best possible job in the world. What can we expect next from the Fuchs laboratory? New approaches, of course! We’ve identified lots of new genes that change their expression patterns as stem cells make epidermis and hair follicles. But we can’t use classical genetics to figure out what all these changes mean—a conditional knockout mouse takes a couple of years to make, and there’s a lot of redundancy in the genome. We’re developing new strategies to make functional analyses of mouse skin development a more tractable process. There are many signaling pathways that must converge to build and maintain tissues during normal development and wound repair, and a lot of pathways go awry to generate the myriad of human skin disorders, including cancers. We know a little bit here and there, yet we still have a lot of pieces to fill in. But I love the puzzle!